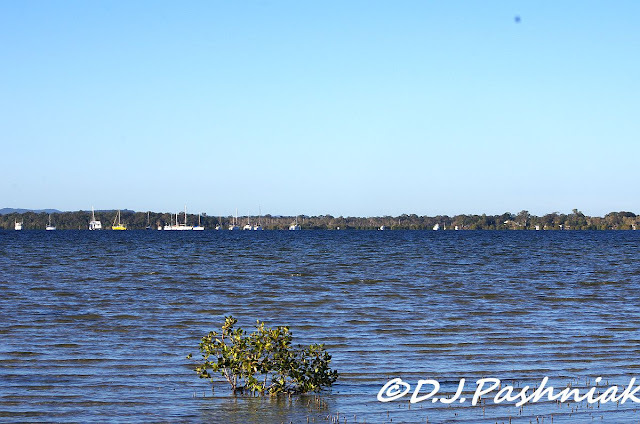 Yesterday was such a beautiful day that I decided to go down to Tin Can Bay and enjoy looking around the shoreline. There are always numbers of boats which use this part of the Strait as an anchorage. I have often seen dinghies at the edge of the bay with someone rowing out to the larger boats. Sometimes then one of the boats will start to motor away and sometimes I think the owner is just checking out his boat and maybe doing some maintenance. 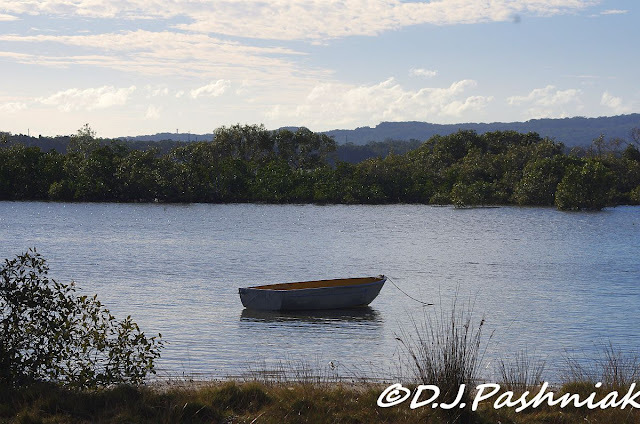 I started out at Norman Point where there is a small sand bank that often has birds sitting at the edge of the water. I expected to see at least Gulls and Terns but was a bit surprised when there was nothing at all. 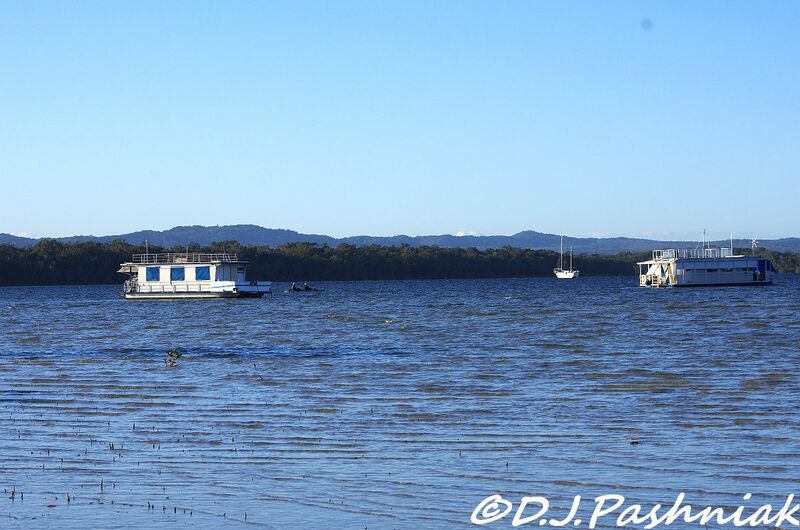 Then I saw a man and his off-leash dog that was enjoying a romp through the shallows! No birds would stay around with that amount of disturbance. 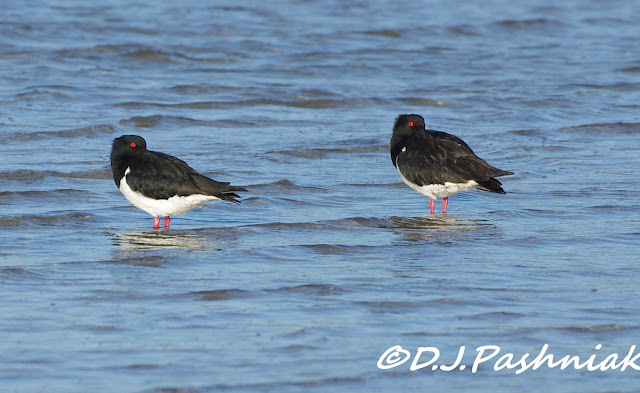 I heard a Pied Oystercatcher flying over and saw a pair of them roosting on the southern side of the point. These were the only birds there also and I wondered if the dog had already enjoyed running along this stretch of beach. Both birds looked as if they were resting but their red eyes were watching me. thanks for sharing the beautiful waters, mick. Beautiful views of the water, boats and the birds. 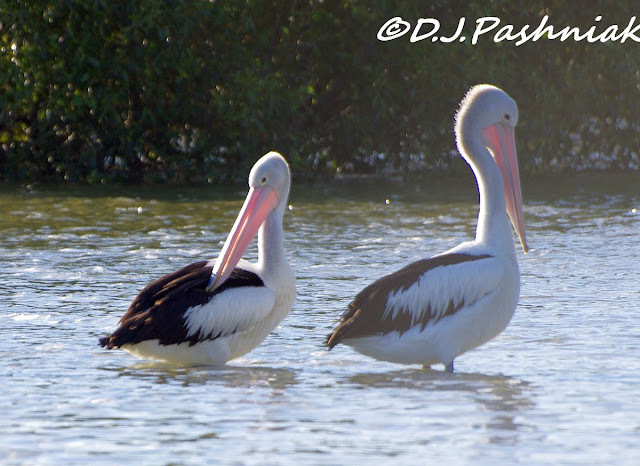 I love both the Oystercatchers and the Pelicans. Great photos. Enjoy your day and the new week ahead! Of course birds don't actually "sleep" as we know it. They momentarily close their eyes to roost. Your Oysterctahcers prove that birds have to be 100% alert to danger even when resting up. They do have wonderful red eyes. Looks like you've enjoyed some lovely sunny days lately. Oh wonderful place and great nature shots! 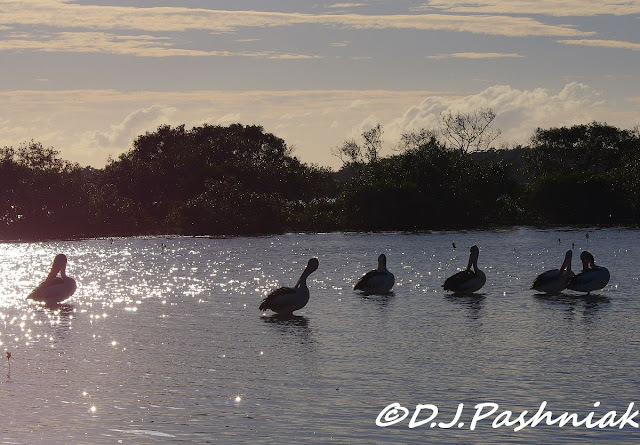 love the preening pelicans -- in silhouette or 'color' -- If I had taken any of those pictures I'd be a happy amateur. Such a pretty place; maybe the boaters just row their dinghy into shore for some exercise; I would -- then take a birding walk to move my legs a bit! -- unless you have a yacht, there's not much room on a sleep-aboard to do your daily dozen. Sorry about the off-leash dog -- that drives me crazy on a quiet beach, but I am afraid to say anything even if I see the dog's owner. So lovely! And those pelicans are adorable. I love the Pelicans. I'd like them to be close to where I live. The Bay is looking good nice to see some Pelicans still there. Those red eyes look wary and suspicious! 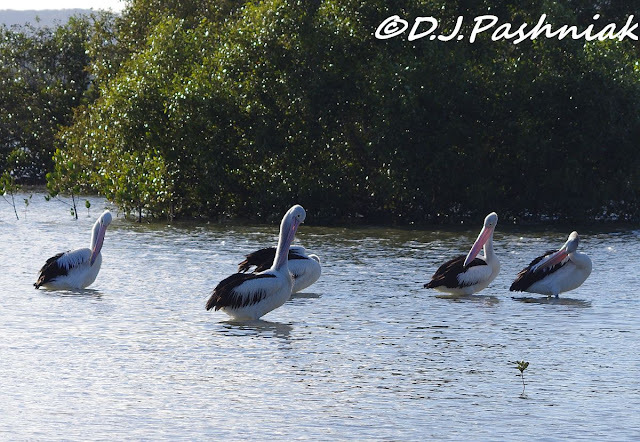 :-) Lovely shots...sorry you didn't see more birds where the man and his dog were. Lovely views over the waters. I love the oystercatchers. They're very handsome birds.